Submitted by portlandpiper on Sun, 2008-02-03 23:36. I was playing with a few different types of sugars this weekend and made these three minor variations of oatmeal cookies. 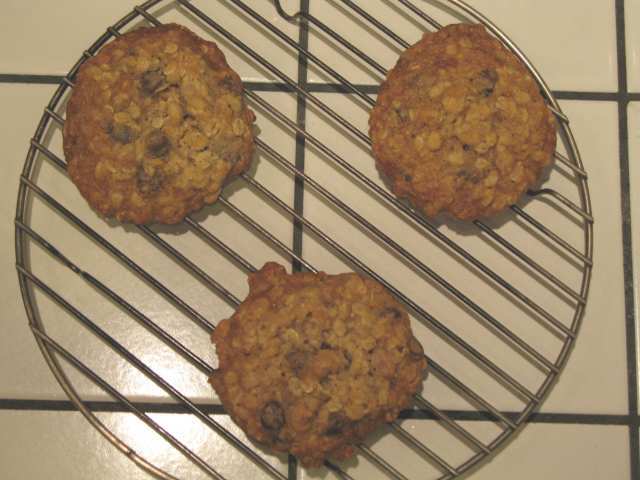 The base recipe came from the back of an old Quaker oat box but I weighed all of the ingredients and timed the mixing of the ingredients so I could make several identical batches of cookies to compare how the different sugars reacted - and of course tasted. Turn oven to 375F and place the butter and egg on the counter. Wait at least 15 minutes for the oven to pre-heat and the butter and egg to warm up to room temperature. Measure and mix the dry ingredients together into one mixing bowl. Beat the butter and sugars together on low for 1 minute, scrape down the bowl, beat for 1 more minute on medium-low. Add the egg and milk and beat on low for 1 minute, scrape down the bowl, beat for 1 more minute on medium-low. Dump in the dry ingredients, chocolate chips, and walnuts and beat on low for 1 more minute. Dish 6 cookies onto each baking sheet and bake for 13 minutes in the middle of the pre-heated oven. Rest the cookies on the baking sheet for 1 minute before removing to a wire rack to cool. Back of old Quaker oats box. I did not use all fructose or cane juice in these cookies because I was just playing with the new sugars for now and not making anything that was for a special diet this time. The top left cookie is regular refined granulated sugar, the top right cookie is dehydrated cane juice, and the bottom middle cookie is fructose. I reduced the fructose by about 1/3 because of how much sweeter it is than the granulated sugar. When I used equal weights the cookies tasted way too sweet. I really could not taste a difference between the sugar and fructose cookies other than the fructose cookie being a bit more cake like in texture. The cane juice cookie had a bit more of the molasses flavour that I associate with brown sugars, but not quite as strong. It did darken a bit more than the other two sugars. There is not much difference in flavours or prices as far as small batches of baked goods go. I would be careful multiplying up a recipe with fructose. It would probably have to have the additional milk cut or removed entirely to keep the wet/dry balance if the recipe were doubled a couple of times. C&H granulated sugar for about $0.93/lb., fructose for $1.09/lb., and cane juice for $1.59/lb. Submitted by portlandpiper on Sat, 2008-02-09 17:56. It was not easy but I saved a couple of each of the cookies for a week in separate containers for the final taste and texture test. As expected cookies made with granulated sugar were the most dry and crumbly. The evaporated cane juice cookies were almost as dry but the cane juice flavour had intensified enough to where it could really be tasted. 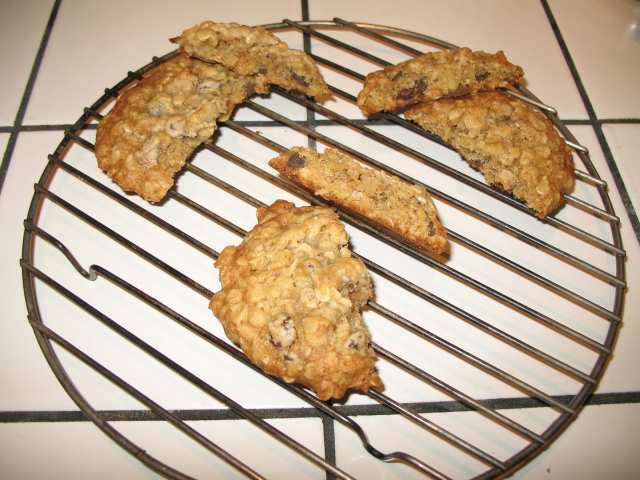 The fructose cookies were almost too moist - the dough had gotten so soft that they were not that enjoyable to eat.